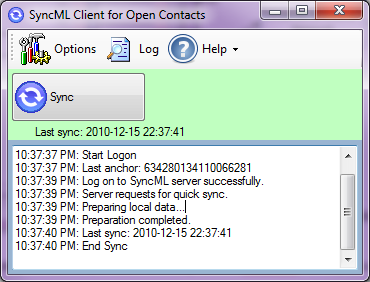 The SyncML Client for Open Contacts is for synchronizing contact info between Open Contacts and a SyncML server which collaborates synchronizations between different devices such as smart phones, PDA, computer programs. And most descriptions of configuration of the SyncML Client also apply to SyncML Client Addin for MS Outlook. The recommended SyncML server is Funambol, which can be installed on a PC, a LAN server, or a Web server. In addition, there are variety of SyncML web sites based on Funambol as listed in the Resources which include mobile phone sync solutions. 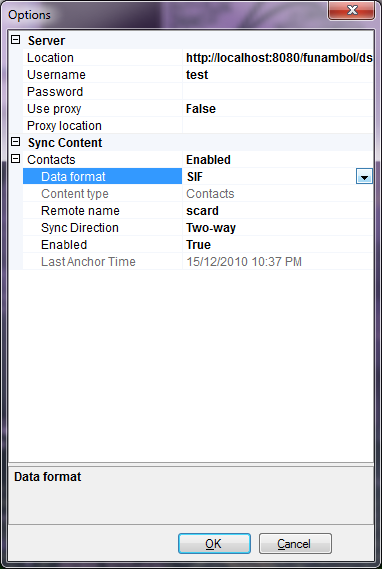 SyncML Client for Open Contacts is distributed as FREEWARE. Please read EULA for details. Open Contacts v5.2.2 or above. In addition, Open Contacts v6.1.2.712 has the SyncML client integrated. * If you run XP and Vista with latest updates, you should have .NET Framework Version 4 already. If you rarely update Windows and are not sure if .NET Framework is installed, you may check "C:\WINDOWS\Microsoft.NET\Framework" and see whether directory "v4.0" exists. If you had installed Open Contacts v6.1.2.712 or above, you already have a SyncML Client integrated with Open Contacts. Initialize a SyncML server account. 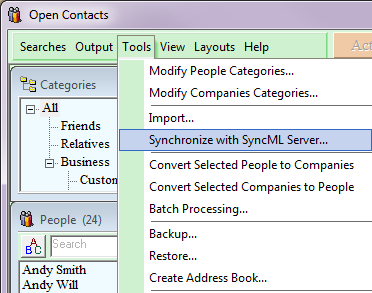 Start Open Contacts, and launch the sync program through [Main menu -> Tools -> Synchronize with SyncML server]. You might be prompted about enabling logging changes, and please do so. Adjust configuration of the SyncML client after clicking on the Options button. If you install Funambol server in your local computer, the server URI is by default "http://localhost:8080/funambol/ds". In case you use the sync program in a Local Area Network behind firewall, you may need to configure the proxy settings. For details of setting up proxy, please check with your local administrator. Please check User Account for more details of configuration.